Awards | Dr. Thomas John, M.D. 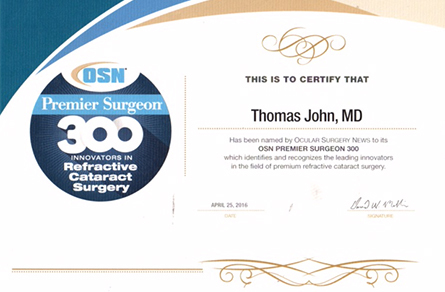 2010 Named in Premier Surgeons 250 (PS250) List of leading innovators in the field of premium IOL surgery in the United States and Canada. 2010 Physician Medal of Honor, for successful cooperation in promoting and affirming achievements in the area of Eye Surgery. Presented by the Military-Medical Academy, Head, Major General Prof. dr. Miodrag Jevtic, III Symposium with International Participation, New Concept in Ophthalmic Surgery, Belgrade, Serbia, September 10, 2010. 2004 America’s Top Doctor 2004, Selected by Castle Connolly Medical, Ltd.
2004 Second Place Award from the American Society of Cataract and Refractive Surgery (ASCRS), at the Annual Meeting held in San Diego, CA, May 01-05, 2004, for the following Poster Presentation: John, T: New Surgical Technique: Use of Indocyanine Green and Forced Hydrodissection for Total Anterior Lamellar Keratoplasty. 2003 America’s Top Doctor 2003, Selected by Castle Connolly Medical, Ltd.
2003 Chicago’s Top Doctor 2003, Selected by Castle Connolly Medical, Ltd.
2002 Poster Selected by the American Society of Cataract and Refractive Surgery (ASCRS) and PhysicianEd, Inc., to be included in the Web Poster Gallery. Poster Title: John, T, John ME, Foulks, R: Scanning Electron Microscopic Study of Four Types of Microkeratome Blades Used for LASIK Surgery. 2001 First Place Award, Surgical Video Competition, from the International Society of Refractive Surgery (ISRS), at the Annual Meeting held in New Orleans, LA, November 8-10, 2001, for the following Surgical Video Presentation: John, T: Surgical Treatment of Acute AlkaliBurn. 2000 First Place Award from the American Society of Cataract and Refractive Surgery (ASCRS), at the Annual Meeting held in Boston, MA, May 20-24, 2000, for the following Poster Presentation: John, T, John, OC, Carey, RB: Bacterial adherence to human sclera, pericardium in saline, processed pericardium, and processed dura matter. 2000 Best of Show Award for the video tape presented at the Annual Meeting of the American Academy of Ophthalmology (AAO), Dallas, Texas, October 22-25, 2000. Videotape Title: Penetrating Keratoplasty, Ahmed Valve and Pericardial Graft. Selected and included in the COVE Program, American Academy of Ophthalmology. 2000 Best of Show Award for the video tape presented at the Annual Meeting of the American Academy of Ophthalmology (AAO), Dallas, Texas, October 22-25, 2000. Videotape Title: New Surgical Technique for the Management of Exposed Ahmed Valve Tube. Selected and included in the COVE Program, American Academy ofOphthalmology. 1999 Videotape selected by Video Journal of Cataract and Refractive Surgeryto be included in this journal, by invitation, from videos presented at the Annual Meeting of the American Society of Cataract and Refractive Ssurgery, Seattle, WA, April 10-14, 1999. Videotape Title: Acute surgical management of extensive iridodialysis with nuclear andcortical lens remnants, intact capsule and corneal edema (Video Journal of Cataract and Refractive Surgery Vol, XVI (1), 2000). 1998 Robert Barnes Award, Best Resident Paper Presentation- Awarded to Michelle Sims, MD (Resident), Loyola University Medical Center, Maywood, Illinois. Paper: Sims M, John, T, Hoffman C: Intraocular bacterial contamination following no-stitch, small-incision, one-handed phacoemulsification. 1997 Videotape selectedas one the six best tapes presented at the Annual Meeting of the American Academy of Ophthalmology (AAO), San Francisco, California, October 26-29, ’97. Videotape Title: Intraoperative control of corneal astigmatism during penetrating keratoplasty: Addition of corneal sutures. Included in the COVE Program, American Academy of Ophthalmology. 1995 First Place AwardFilm Festival Award, Special Interest Surgical Video Presentation, American Society of Cataract and Refractive Surgery (ASCRS), San Diego, California April 1 – 5. 1990 Fisons Travel Grant Award, The Annual Meeting of The Contact Lens Association of Ophthalmologists ( CLAO ), January 10-13, 1990, New Orleans, Louisiana. 1989 Seeberger Scholar, Department of Ophthalmology and Visual Science, The Pritzker School of Medicine, The University of Chicago, Chicago, Illinois. 1985 Dr. H. J. Mehta Memorial Research Prize from St. John’s Medical College, Bangalore, India. 1984 Robert E. Shoemaker Award for the third time from the Pennsylvania Academy of Ophthalmology and Otolaryngology at the Annual Meeting, May 26. 1983 Robert E. Shoemaker Award from the Pennsylvania Academy of Ophthalmology and Otolaryngology at the Annual Meeting, May 28. 1983 Best Resident Paper Award from the University of Pennsylvania Alumni Ophthalmological Association, April 15. 1971 First Class in Pre-Professional. Examination in Medicine.